Have you seen the October 3rd Moda Bake Shop recipe? Wow we have, we actually have the original recipe in our shop on display. 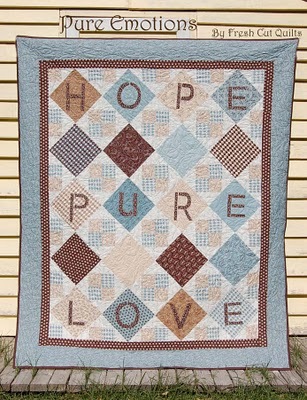 We have joined Designed by Kari @ Fresh Cut Quilts with another recipe. It is yummy. To make your shopping easy we have kitted the Pure Emotion quilt for you. We have also added a new category to our site Moda Bake Shop kits. We will be adding new kits, when we have the ingredients to make that special recipe. This entry was posted on Sunday, October 3rd, 2010 at 7:05 am and is filed under Uncategorized. You can follow any responses to this entry through the RSS 2.0 feed. You can leave a response, or trackback from your own site.